Spend the afternoon at JCC Grossman Camp experiencing the magic of camp with your family! 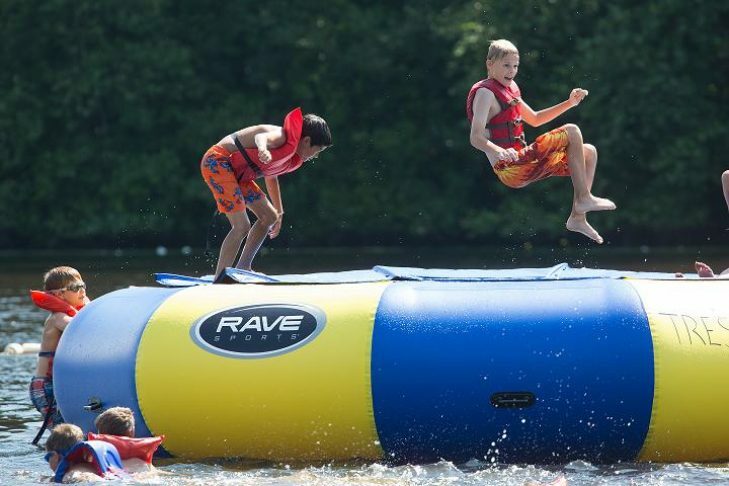 Enjoy a range of activities including: waterfront (beach, swimming, boating, water trampoline, water slide, fishing and more), sports (gaga, basketball, and street hockey), arts and crafts, rock climbing wall and more. Located on Dover Road in Westwood (GPS address: 294 Powissett Street, Dover). Everyone welcome. Rain date is August 9. No charge. Check bostonjcc.org/grossmanjccday2016 after 11am on the day of the event for a weather update. All JCC arts and humanities offerings are programs of the Ryna Greenbaum JCC Center for the Arts. For more information, visit bostonjcc.org/grossmanJCCDay2016 or contact grossman@jccgb.org or 617-244-5124. JCC Grossman Camp is a day camp for boys and girls ages 4.5-15 located on Hale Reservation in Westwood. Bus transportation available from more than 40 communities throughout Greater Boston. Varied activities give Grossman campers lots of opportunities to explore nature, develop new skills and interests in a fun, positive and active environment. Supportive, experienced counselors and staff help them to develop the confidence to tackle these activities in a Jewish camping environment. For more information, visit bostonjcc.org/grossman or contact grossman@jccgb.org or 617-244-5124.